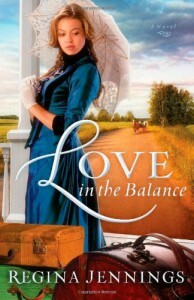 In a time where even God fearing families opted for marriage within the same or better class, Molly struggles in her decision to follow her heart or please her parents by marrying into money. The premise for the story is good and there are plenty of moments that serve as a beautiful example of God’s love, making the story overall a good one.I was grabbed from the beginning as the story starts off with a lot of drama and turmoil. I enjoyed Molly, who is largely flawed, but desires to do the right thing for the most part. Molly’s love interest Baily, is a wonderful Godly man. There is another character, Edward, who although is shady, makes for an interesting character with his Rhett Butler traits.The problems that I had with the story was that there were to many sub-plots which slowed the story near the middle and the resolution seemed to take too long.I enjoyed not being able to figure out how things would turn out and I did like how things finally wrapped up in the end and was left feeling good about the time that I spent in the book.